Sprinkle the salt over the mixture and massage thoroughly for around 2-3 mins, you want it to start softening, and you will see the color of the cabbage change. Then add in the juniper berries and caraway seeds. 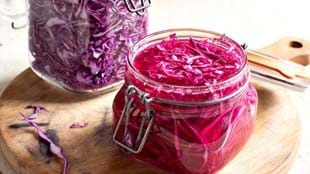 Let the mixture sit for one hour so the salt can draw the liquids out from the cabbage and beetroot and the mixture softens further. Place a thick piece of fabric over the jar and tie securely with a rubber band or some string. While it's fermenting you may see bubbles coming through the cabbage or foam on the top – sometimes even a white scum. Don't worry, these are all normal. The scum can be skimmed off the top before refrigerating.